Huntsman spiders are also are called giant crab spiders, because of their size and appearance. The larger members of the species are sometimes referred to as wood spiders, because of their preference for woody places, like forests, mines shafts, woodpiles, wooden out-buildings. On the upper surface of huntsman spiders, the main colors are shades of brown or grey. However, other species have undersides that are marked in black and white, with reddish patches; over the mouth-parts. Because of their furry appearance, people unfamiliar with spiders may confuse large Huntsman spiders, with tarantulas. Huntsman spiders occur in practically all warm temperate to tropical regions of the world, including much of the United States. They are most often discovered living under rocks and tree bark, as well as in sheds, garages and other quiet environments. A species of huntsman can be found in Hawaii, where it is more commonly known, as a cane spider. As adults, huntsman spiders do not build webs, but hunt and forage for a constant food supply; of insects and other invertebrates. 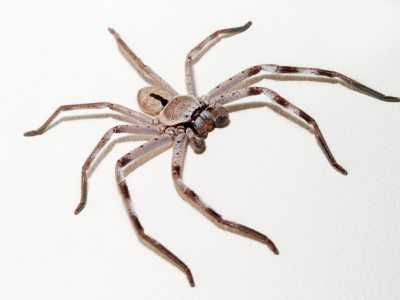 Although Huntsman spiders have been known to inflict defensive bites on people, they are not widely regarded as a pest control problem, or dangerous to a healthy human. 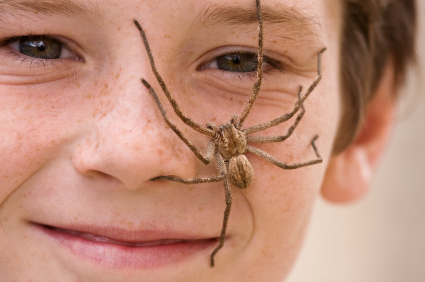 In fact, Huntsman spiders are widely considered to be beneficial insects, because they feed on a variety of insect pests; such as cockroaches. In some instances, homeowners will relocate huntsman spiders to the garden, rather than kill them.